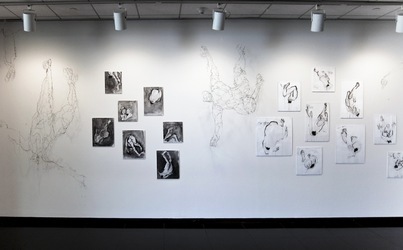 My wire sculptures and mixed media installation pieces reference the female form and become drawings in space. The wires change in thickness as a drawn line might. Words like thoughts appear. The wire creates a tension--"wired"--while also conveying both strength and fragility. Wire figures are suspended in space, clinging to walls, sitting, crouching, appearing and disappearing; secrets are whispered, fears revealed. The viewer is eavesdropping on someone's secret obsessive thoughts. I strip the figure bare, revealing both strength and vulnerability while exposing longing, loneliness and fear in a changing and uncertain world.